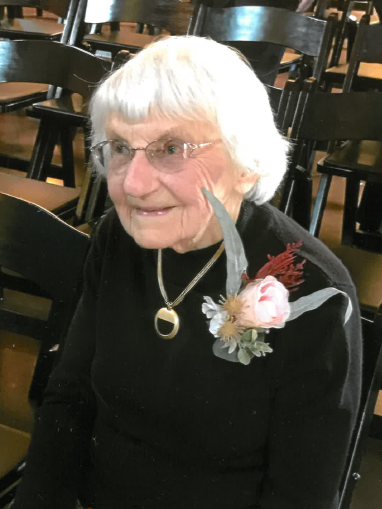 Carolyn L. Steele, (nee Fries) passed peacefully on March 25, 2018 in her 100th year. She is the beloved wife of the late Milton Camery Steele. Dear mother of Judith A. (Gary) Smith, of Cincinnati & Geraldine C. (Roger) Magill, of Southport , N.C.. Devoted grandmother of Vincent (Sandra) and Nathan (Sharon) Smith and Kyle (Annaka) Magill. Loving great grandmother of Stevie, Vivian, Ethan and Martin Smith and Cayman and Katarina Magill. Daughter of the late Lena and Joseph Fries. Sister of the late Violet Koester and the late Lillian Pendery. Also survived by many loving nieces, nephews and friends. Friends are invited to a visitation Friday March 30, from 10 AM until celebration of life ceremony at 11 AM, all at the Dalbert, Woodruff & Isenogle Funeral Home 2880 Boudinot Avenue. In lieu of flowers, the family suggests that memorials be made to the Oak Hills United Methodist Church 6069 Bridgetown Rd. Cincinnati, OH 45248 or Hospice of Cincinnati: Hospice of Cincinnati P.O. Box 633597 Cincinnati, OH 45263.